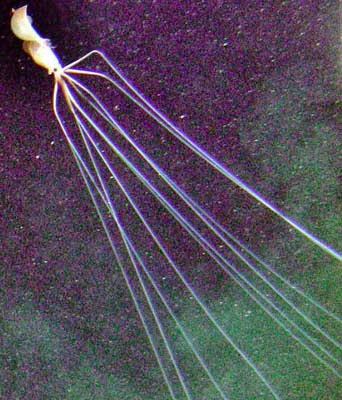 The Bigfin squid is a poorly understood group of cephalopods of the Magnapinnidae family. For now, the little knowledge we have about them, comes from larval, paralarval, and juvenile specimens, as researchers have yet to capture an adult specimen. Many believe that footage and pictures of deep sea, alien-like creatures nicknamed "long-arm squids", should be attributed to adult Bigfin squids. This mainly because their fins are extremely large and proportionately as big as those of Bigfin squid larvae. However, until we get our hands on an adult specimen -or at least a sample- we can't be certain if these long arm squids are of the Magnapinna genus or simply distant relatives. The first record of a Magnapinna species dates back to 1907, when a badly damaged M. talismani specimen was caught off the Azores. Due to its bad condition, no remarkable observations were made. It was first classified as Chiroteuthopsis talismani and then as Mastigoteuthis talismani. Five decades later, in 1956, a similar creature (Magnapinna sp. C) was caught in the South Atlantic, but it didn't receive much attention. The specimen was illustrated in Alister Hardy's The Open Sea, where it was identified as an Octopodoteuthopsis. In the 1990s, five more immature specimens were found. Two in the Atlantic (Magnapinna sp. A), and three in the Pacific (Magnapinna pacifica). Chief investigators for the latter three, were researchers Michael Vecchione and Richard Young, who eventually linked them with the two specimens from the Atlantic. The two scientists later established the family Magnapinnidae, in 1998. A specimen of a fifth species, Magnapinna sp. B, was collected in 2004. In 2006, Magnapinna sp. A was described as Magnapinna atlantica.. The squid's pigment is contained mostly in functional chromatophores. Alaminos Canyon, at a depth of 2377 meters(7800 ft). The species holotype is deposited in the National Museum of Natural History. 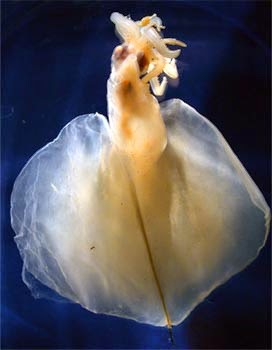 It is an immature female with a mantle length of 59 mm, captured in the Gulf of Mexico on September 16, 1995. 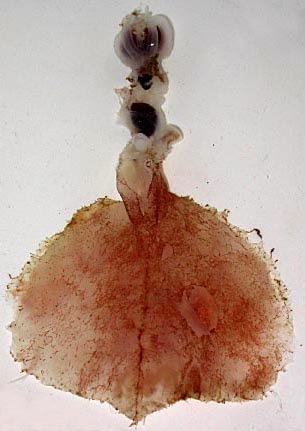 The specimen is in relatively good condition, with only minor damage to the tips of the arms and tentacles. 2) Magnapinna pacifica is known from three immature specimens, two caught at a depth of less than 300 m and one recovered from a fish stomach. It is characterized primarily by its proximal tentacles, which are wider than adjacent arms, bearing numerous suckers. The holotype is a juvenile specimen with a 51 mm mantle length , captured at the Californian coast at a depth of 0-200 m in a Bongo plankton net. 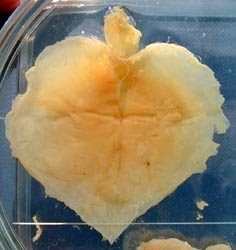 3) Magnapinna talismani is known from a single, severely damaged specimen. It is characterized by small white nodules present on the ventral surface of its fins. The holotype of the species was collected in the northern Atlantic Ocean, south of the Azore. It is an immature female with a mantle length of 61 mm. 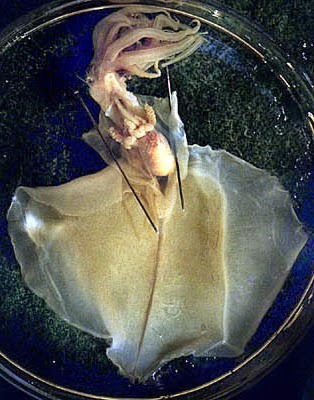 The bad condition of the holotype makes comparisons with other bigfin squid species nearly impossible. 4) Magnapinna sp. B is an undescribed bigfin squid known from a single immature and badly damaged specimen, collected in the northern Atlantic Ocean. The specimen is a juvenile male with 95 mm mantle length and is held at the Bergen Museum. It is characterized by its dark epidermal pigmentation, which is epithelial, as opposed to the chromatophoral pigmentation found in other Magnapinna squids. The specimen was caught by the R/V G.O. SARS on July 11, 2004. 5) Magnapinna sp. C is an undescribed species of bigfin squid known from a single juvenile male collected in the southern Atlantic Ocean, with a mantle length of 79 mm. It is held in the Natural History Museum. The researchers who retrieved the specimen are still uncertain "whether this represents a separate species or is conspecific with M. atlantica and/or M. talismani." Adult Bigfin squids are surely a sight to behold. Researchers may have yet to catch an adult individual, however, thanks to the increased usage of remotely operated vehicles and submersibles, more and more videos of them emerge every now and then. The first visual record of a long-arm squid dates back to September 1988, when the crew of the submersible Nautile encountered a bigfin squid off the coast of northern Brazil, at a depth of 4,735 meters (15,535 ft). Five years later, on July 1992, the crew of the same submersible was lucky enough to again witness two individuals. First it came across the same individual twice, during a dive off the coast of Ghana at 3,010 meters (9,880 ft) depth, and then another one off Senegal at 2,950 meters (9,680 ft). Both individuals were filmed and photographed. The next recorded sighting was in November 1998 when the Japanese manned submersible Shinkai 6500 filmed another long-arm squid in the Indian Ocean, south of Mauritius, at a depth of 2,340 meters (7,680 ft). In January 2000, a ROV of the oil-drilling ship Millennium Explorer filmed an individual at Mississippi Canyon, in the Gulf of Mexico at a depth of 2,195 meters (7,201 ft). The squid was estimated to be about 7 meters long. Next, in May 2000, the ROV Atalante took footage of an individual at the Indian Ocean at 2,576 meters (8,451 ft) deep, in the area of Rodrigues Island, . Finally, in October of the same year the manned submersible Alvin found yet another long-armed squid at 1,940 meters (6,360 ft) in Atwater Valley, Gulf of Mexico. Up to 2001, none of the aforementioned sightings had received any serious media attention. This changed when in May 2001, ten minutes of crisp footage of a long-armed squid that was shot by ROV Tiburon, were released to the public. The creature was filmed in the Pacific Ocean, north of Oʻahu, Hawai at 3,380 meters (11,090 ft). On November 11, 2007, new footage of a long-arm squid came from Perdido, a drilling site owned by Shell Oil Company. The video at the beginning of the article is from that encounter. As you can see on the videos, adults have remarkably large arms and tentacles, of about the same length. The appendages are held perpendicular to the body, giving the appearance of strange "elbows". The elastic tentacles have been estimated to be 15 to 20 times the mantle length when stretched,, while estimations based on video footage place the maximum total length of these creatures to at least 8 meters (26 ft). Other than the large appendages, the fins are also extremely large. According to deep-sea biologist Bruce Robison, adults may use their arms and tentacles as "fingers", scooping the sea floor and grasping any edible organisms as they drift in the ocean waters. Colossal Squid: The colossal squid (Mesonychoteuthis hamiltoni) is believed to be the largest squid species in terms of mass. Promachoteuthis sulcus: Some people, including me, think that Bigfin Squids look like the alien from the Independence Day film. 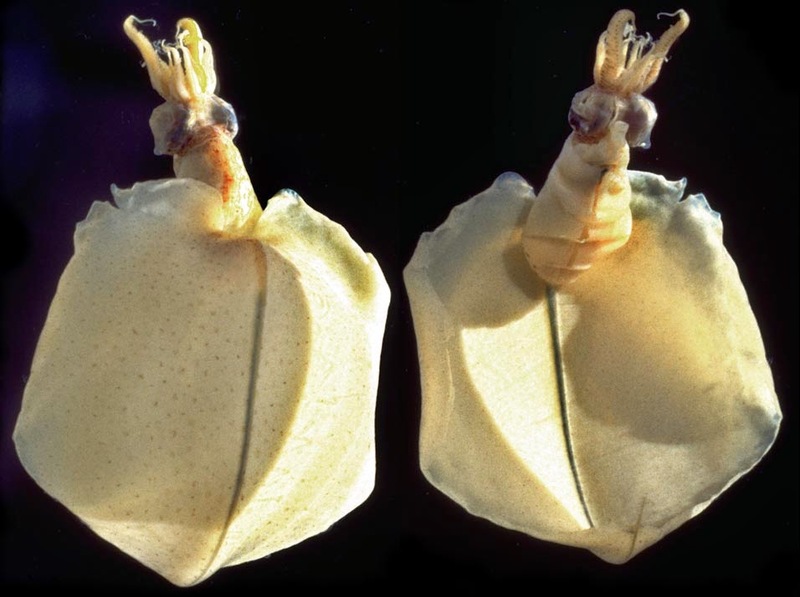 Similarly, Promachoteuthis sulcus is a squid that looks like the face-hugger from the alien franchise! - Fischer, H. & L. Joubin (1907): Expéditions scientifiques du Travailleur et du Talisman. Céphalopodes 8: 313–353. - Hearn, K. (2008): Alien-like Squid With "Elbows" Filmed at Drilling Site. National Geographic News, November 24, 2008.